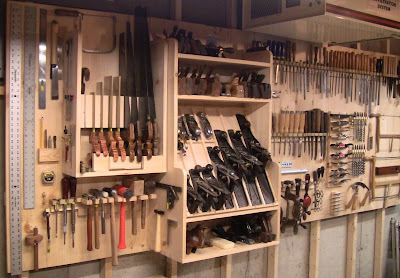 My Wall-O-Tools is finished. I had to add another panel on the right. It's now so wide I'm having trouble photographing it. (Note: you can click on any of the photos here to see a much higher resolution version at Google Picasa, where you can zoom in and look at details). 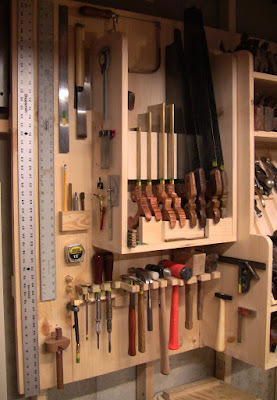 11 linear feet of tool storage bliss. Plus last remnant of pegboard. Who knew I had that much stuff? No wonder my other storage was so cluttered. Even as I was making the various tool hangers to attach to the boards, I could tell the difference it made in how I work. With each new holder full, I could account for my tools more easily. Grab and go, then put it back. For the first time in my life, a place for everything, and everything in its place. One glance at the wall tells me if something is missing. 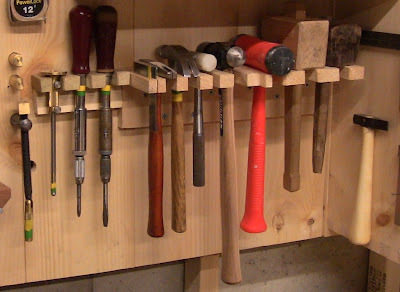 An empty spot just offends my sense of order so much that it compels me to put the tool back. The tools for every operation close to hand and accounted for. Getting this done is as satisfying as completing my workbench. It gives me the same feeling of power, knowing I have the capability to build things. With a couple of exceptions, I made modular mountable racks for anything that didn't just hang on a couple nails. That way I can easily rearrange the racks if I need to later on. I'm sure I'll continue to tweak things. In fact, the boards are full of extra holes where I screwed in a rack or hammered in some nails, only to change my mind and move it almost immediately. Partly that's because I didn't bother planning it out, I just put stuff up and fit it as I worked. 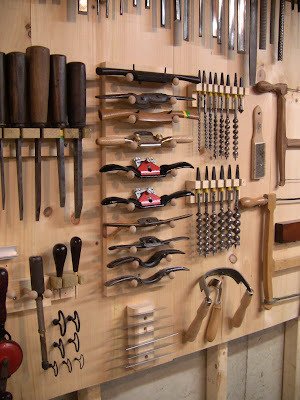 One thing to watch out for is to make sure there are adequate clearances all around each tool. It's temping to try to pack everything in tightly, but then your hand starts bumping into things, risking injury or tool damage if something falls off. Remember, my goal was to be able to access everything quickly without having to move anything aside or dig around. Nothing in the way of anything else. Nothing bumping into anything else. Nothing to impede my work. Spread out, use that open space. Add another panel! Remember that bit I cut off the saw till and said I would turn into some kind of shelf thingy? Well, here it is, turned into two sections of revised hammer storage of different depths. I cut the dovetailed corners off and rip-sawed fingers into them, getting twice as many hammers into the same space. Right side. I used Shaker pegs for the boring tools and the upper right drawknife. 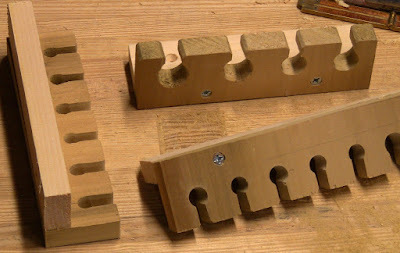 Detail of spokeshave, scraper, and auger bit racks. 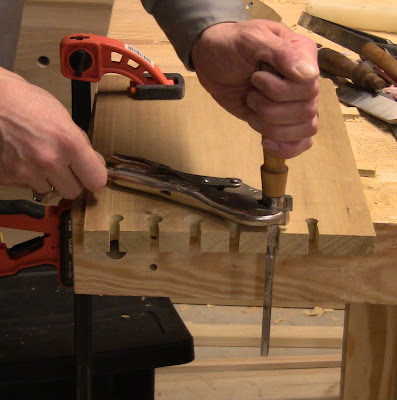 You can also see the gimlet storage to the left under the awl rack: just drill 'em right into the board. Speaking of which, I made liberal use of awl and gimlet to predrill nail holes so I didn't have to pound them in so hard. 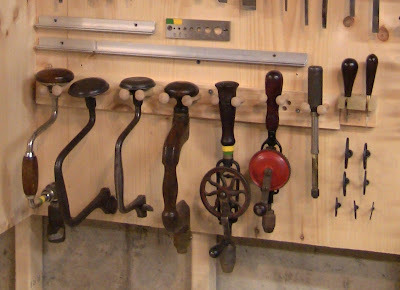 Detail of boring tool storage. Also, aluminum angle winding sticks in two lengths, and dowel plate. I replaced the original chisel racks with numerous smaller racks, one per set of the same chisel type. These consisted of a poplar top piece glued and screwed to a pine mounting piece. By boring slightly undersized holes in the top piece, sawing slots to them, and then sanding the holes out a bit, I was able to get snug fits. The chisels go in and out smoothly and quickly. Except for the narrow ones, they go in by twisting sideways to slide flat into the slot, then twist back to lock securely in place. I had a couple of false starts making the top pieces from pine, so I switched to poplar. Even then I still had some splitting as I was boring holes so near the end grain. What's this strange operation? Custom fitting a chisel hole to a tapered socket chisel. Adhesive-backed sandpaper wrapped around the taper, the vise-grips just tight enough to hold on and act as a lever arm to spin it in place. Chisel racks. Top right one is for ferruled handles, other two are for socket chisels. The question arises, do I really need all those chisels? Of course I do! What a silly question! Ok, not really. I made 9 chisel racks. With 4-7 sizes per set, that's probably more chisel choices than I need. In fact, I could probably cut the number of each type of tool to half or even a quarter of what you see here and still do just fine. So it's not necessary to have this many. It's just hard to resist a nice hunk of metal at a flea market. A $2 chisel here, a $5 eggbeater there, they start to pile up. In addition to these, I have doubles of a number of items tucked away in case something gets damaged or my daughter wants to assemble her own set. 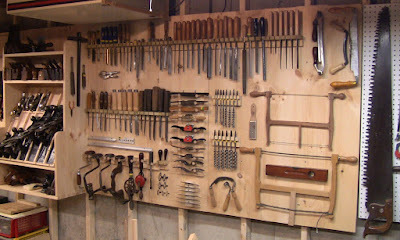 Now that my tools are organized, I can finish tidying things up. Like Hemingway, I appreciate a clean, well-lighted place. Love it! This blog had me pricing pine boards this week. Just one question. Do you need to run a dehumidifier? Looking good, I hope my wall looks half that good when I get there. 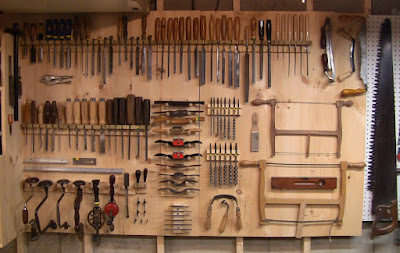 Great wall of tools. I think I would have a difficult time doing any woodworking. I don't think I could bring myself to disturb anything. Thanks, guys! Sorry, I already have plans for the cart! I'll clear it off, remove all the hangers from it, and use it pretty much as originally intended: to hold the tools I'm using right at the moment. Such as when cutting dovetails, where I need square, bevel gauge, dovetail saw, coping saw, and chisel. It's nice to have a spot to lay things down just for the moment while completing a set of operations without putting them on the bench. That way I can keep the field of work clear, without having to move back and forth repeatedly between bench and wall. The bench, wall, and cart form my work triangle. That's the theory, anyway, and I'm sticking to it. I didn't do anything to compensate for movement, so we'll see how that works out over time. I made the classic mistake of butting the panels all together in the winter time. If that causes a problem in the humidity of summer, I can remount the panels with some gap between them. I can even remount the rear cleats if necessary, since they're just screwed on. And the satisfaction of being able to instantly pluck the right tool off the wall outweighs the fear of disturbing it! Then right back as soon as possible, restoring order to the universe. Very impressive job, Steve. Great job! Fabulous. Very impressive. Saw tills seem to be the flavour of the month at the moment. Wow! Eleven linear feet of awesomeness. Steve, regarding the problems with the chisel racks, I've found that laminating a piece oh hardboard onto both surfaces solves the problem and strengthens the rack. After sanding and finishing it looks great, too.